I never should have downloaded a free iOS game about breeding cute and colorful dragons; it was a tremendously bad idea on my part. Normally I'd have avoided such things. I blame Crecente for dropping a link to the game into our inter-office chat room with only the word "cute" as a descriptor. You can't expect me to not click on something like that. Several months later I'm a level 21 dragon breeder. Oh how I loathe thee, Dragonvale, and by Loathe what I really mean is love, only with a side order of hate for the irrational things you make me do. Call it a dragon farming game (it is); call it a money sink (it can be), Dragonvale is one of those casual-friendly, slightly-social games that rewards players for time and/or money spent with colorful things that flitter about on their screen, not really doing all that much of anything. Here's how Dragonvale's particular scheme players out: You build a habitat, buy (or breed) an egg, let it hatch, and then place the newborn dragon in your habitat, where it generates gold. Use gold to buy more habitats. 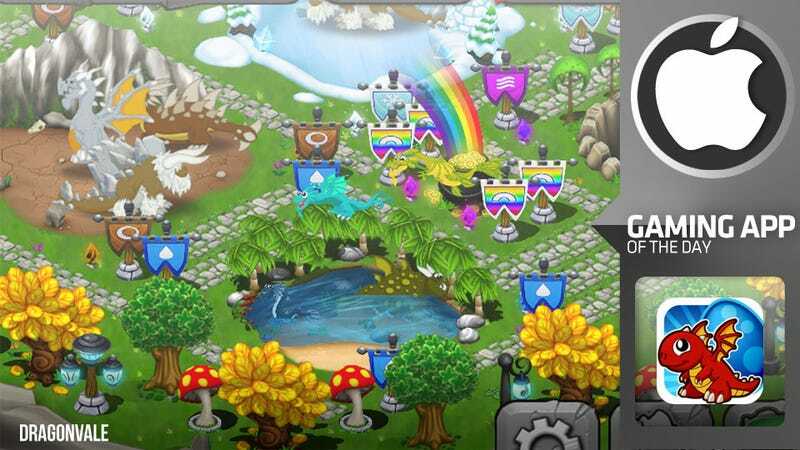 Grow crops to feed your dragons, leveling them up so they generate more money so you can buy more habitats. Gaining experience point levels unlocks new buildings, decorations, and dragon types. It's a formula so many other games have done before. If not for the dragon breeding aspect of the game I probably would have come away without spending a single additional cent on the free app. You see, breeding certain dragons together in the game's breeding cave (or on the newly-released breeding island) results in the birth of completely new dragon types. Air and Water dragons create a Fog dragon, for instance. Further breeding can yield rare dragons, like the legendary Rainbow dragon, which I've managed to avoid breeding for several months now. The waiting is the hardest part, of course. Developers like Backflip Studios bank on it, and it's certainly made them some money off of me. Breeding dragons takes time. First the dragons have to breed, which can take up to 48 hours (in extreme cases). Then the eggs have to incubate for an equal amount of time. Buildings take time to be constructed, foliage takes time to be cleared, and crops take time to grow. All of this can be sped up for the price of one magic crystal per hour, available via in-game store for $1.99 per 50. Large bundles are available, but the $1.99 was my sweet spot at least 25 times over. To my credit I only used the crystals to speed up time; I've never used them to buy a dragon breed. My bloodline is pure and nearly complete, save the elusive Moon and Rainbow dragons. Unfortunately Backflip releases seasonal dragons on a regular basis, so every time I think I'm prepared to walk away they sink their claws in deeper. I've been on a real Android kick lately, so haven't had much time for iOS games on my one remaining outlet for them (go cracked screen iPad! ), but seeing as Dragonvale's been devouring my free time (and spare cash) for months, I figured it was only appropriate that my last Gaming App of the Day post for 2011 be about the game that I've been playing whenever I haven't had to play games.